Sick of his useless ways. Don’t get mad, get him Man Skills: Everything Men Need (Or Just Want) To Know. 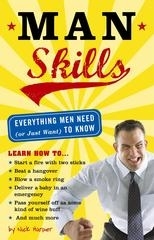 This simple handbook answers all the “how to” questions most men are afraid to ask. Just in case his reading isn’t up to par, Man Skills also has illustrations for the trickiest maneuvers. He’ll go from novice to pro once he’s done with this book. Hey, you may even want to borrow it from him and sharpen your own skills. Amazon.com, $12.95.